VAL (Valérie Girone) is a French artist who lives and works in Paris. She was lucky enough to grow up and study on the French Riviera. 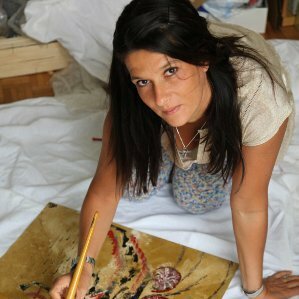 The South of France is indeed blessed with a different notion of time and space and filled with colors that naturally foster the imagination As a young girl, she painted and drew on any material she could find, but she finally decided to study literature while keeping up with her passion: painting. After undergraduate studies in semiotics and literary science, she obtained a master in modern literature and became a journalist. This work environment provided many opportunities to boost her creativity through encounters and experiences on the field. For several years, her two activities, journalism and painting, reinforced one another. For the longest time, she defined herself as literary trained, journalist by experience, and artist by intuition and need. For a society where creativity is absent, and where men, women and children are no longer moved by what feels good is a dead society. Being an artist at this stage of her life is a social act. In 2007, a gallery owner noticed her work. Then came the first exhibition and the beginning of her new full-time career. She left journalism behind. Today, her technique is based on working with various sheets of metal. On aluminium which can be easily recycled, she builds worlds where contemporary urbanity blends in with pictorial abstraction and various traditional symbols. Val throws herself with flying colours on cold and carnal materials, vibrant and full of energy. She cuts her raw aluminium sheets and directly covers the metal with acrylic paint. She finishes it with an epoxy coating which helps saturate the colors, emphasize and enlighten everything while”worsening” the metallic and creased aspect of the aluminium. What single phrase could define her work? Abstraction is the only way to paint reality.